is it? I bought on that dip. I see 10$ before the AMA. Don't get fooled by quick pump, you'll just be a food for the whales. I really don't think a Q and A would just pump it. Yes, indeed. There were dozens of AMA sessions earlier. Never thought that an AMA session could cause a pump. I have seen a similar session in early July - nothing special and it couldn't stop the price from falling to the recent lows. Wish I had expanded my Lisk assets. I was greedy and though 3 dollars was too much, wanted to step in a few cents less. Now I'm hating myself for it. Guess I've learned my lesson, there is a thing called being too conservative. Even moderation should not be practiced to excess . .
Well if you have posted a btc address in the forum that you can sign a message then you can recover it by contacting Cyrus a staff member. Probably LISK competitors will be pumping too. We'll see soon! Turns me off when I open the wallet. What is mean "Total Awarded" on GDT Pool site? I thought this is the amount that has already been paid. But I did not receive a single lisk. Lisk is on the rampage now. I made some profits with its recent pump . I'll will just keep an eye of its movement so that I will gain more profits and take advantage of it. Finally LISK is getting the attention it deserves from the market. Good times ahead for those hold and wait. Ok I am really wondering how high this ride will take us? Any guesses here? Are we going to hit 10 dollars for now? Probably we can hit $10 followed by a flash crash, I don't see any development that Lisk can hold at the current price especially when bitcoin price is starting to go up again. Astonishing, on an All Time High, isn't it? Should really start to go up again. Be careful joining "rich list clubs" unless your Facebook profile can't trace you back to your real identity. I just sent out this weeks payout for all my voters. This was the 20th payout in a row. If you haven't yet, vote for me, I'm currently offering one of the highest return to voters. Delegate Vega is now in position #97 offering 50% profit sharing. 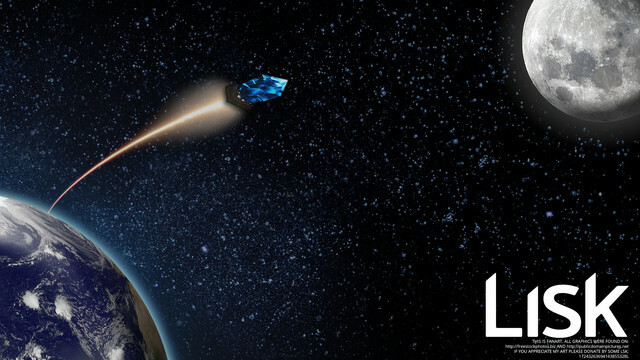 Hi, here is my LISK To The Moon fanart FullHD desktop wallpaper. FullDH url: https://ibb.co/gmgUgk (click right mouse button and "save graphic as ..." if You want to save on your device). Dat lisk pump is just speculative or any fine news? Thats why there are delegates doing a vote buying, voters gets to be rewarded when the delegates get some of their reward. haven't you noticed the tons of posts by delegates in this thread? Correct, let's hope no one kidnaps Max and Isabella at the Lisk office in Berlin. .